Already beloved by gaming fans around the world, the charming and powerful Starfy will celebrate the launch of his first game in the United States, The Legendary Starfy for Nintendo DS, at a unique retail event inside New York’s Nintendo World store. Making his debut appearance at the Nintendo World store, Starfy himself will be available for photo opportunities with fans of all ages in a special underwater-themed area. The July 11 celebration will also feature face painting and chance for attendees to play The Legendary Starfy and win fun Starfy prizes. Released in the U.S. on June 8, The Legendary Starfy places its charming, five-pointed hero at the center of a wild adventure as he completes a series of challenges that highlight his incredible bravery and impressive underwater moves. 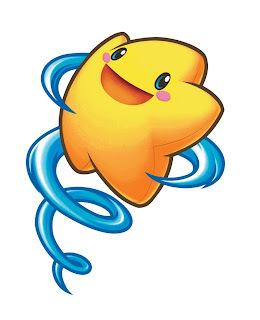 Nintendo’s newest standout character, Starfy is one fierce friend that everyone will want to meet. It sounds like it'll be a lot of fun for the kids and anybody who likes Starfy - *cough*cough*me*cough*, especially that Starfy will be there in person. He is legendary you know.